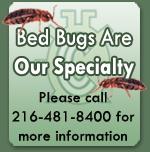 Cleveland Chemical Pest Control has been proudly serving families and businesses in the Cleveland and Northeast Ohio area for over 110 years. We blend the experience of generations of pest control knowledge with the latest technological advances to bring you unparalleled service quality. All of our service technicians are licensed with the Ohio Department of Agriculture and receive yearly ongoing training and updates. Our technicians average over 25 years of experience. We have an Associate Certified Entomologist (ACE) on staff to properly identify any type of insect pest. Cleveland Chemical is a proud member of Ohio Environmental Health Association and local, state, national pest control and business associations. Cleveland Chemical's goal is the complete satisfaction of our customers by solving pest problems in an environmentally responsible way. We offer a wide variety of pest control services using Integrated Pest Management techniques (IPM) when possible, tailored to your particular needs, whether it is a one time application, or a regular preventative service program.